Chicago | Reuters — U.S. cattle futures climbed more than one per cent on Tuesday, fueled by fund buying on the first trading day of the month and strong demand for beef, traders and analysts said. Chicago Mercantile Exchange October live cattle finished 1.1 cents higher at 109.875 cents/lb. while December futures added 1.425 cents to close at 114.4 cents (all figures US$). “With the first trading day of September, the funds have come in to put a little new money to work on the long side,” said Jeff French, analyst with Top Third Ag Marketing. Meanwhile, robust demand for beef amid a strong U.S. economy and low unemployment has supported prices despite plentiful supplies of cattle at feedlots, he said. “Demand for beef has been phenomenal,” French said. The wholesale choice boxed beef cutout rose 98 cents on Tuesday morning to $210.67/cwt, while the select cutout gained 86 cents to $202.13, according to the U.S. Department of Agriculture. Traders are anticipating better packer demand for cattle at feed yards this week as they will be buying for a full week’s slaughter. 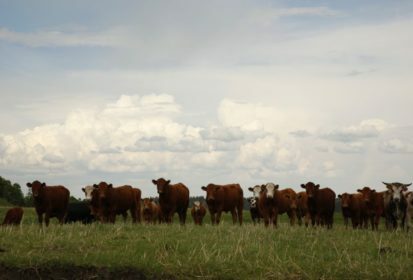 Fed cattle lightly traded at lower prices late last week ahead of the long Labour Day holiday weekend, which reduced the slaughter by about a day this week. CME feeder cattle rallied as well, lifted by technical buying and good demand for animals as feed prices are near their lowest levels in years. September feeder cattle were up 2.275 cents at 151.725 cents/lb. while actively traded October ended up 2.7 cents at 151.825 cents/lb. Worries about African swine fever in China buoyed lean hog prices as U.S. pork demand could accelerate if the world’s top hog- and pork-producing country is forced to cull a large share of its domestic herd. China typically buys pork from Europe, but may turn to U.S. shipments if supplies there run low. China reported another outbreak of African swine fever late on Monday, its third new case in two days and the eighth case since the virus was first reported in the country a month ago. CME October lean hog futures rose 0.65 cent, to 51.075 cents/lb., and December was up 1.85 cents at 55.25 cents. — Karl Plume reports on agriculture and agribusiness for Reuters from Chicago.